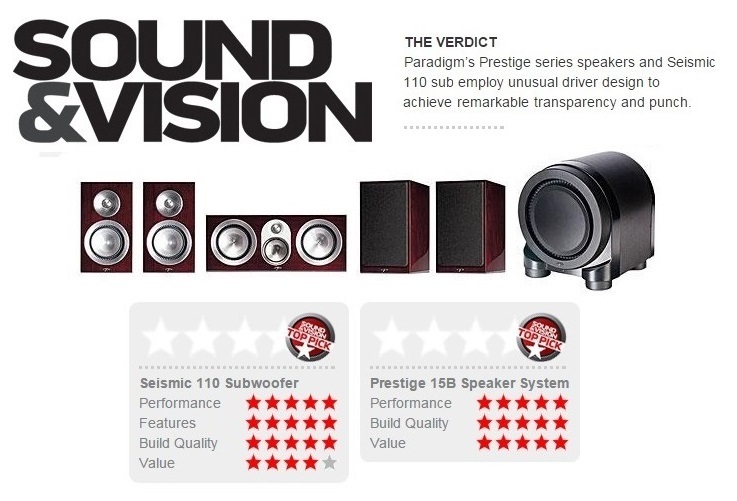 We are incredibly proud to share that the Paradigm Speakers Prestige 15B, Prestige 45C and Seismic 110 sub received 5 stars and "Top Pick" awards from Sound & Vision in the first 5.1 Prestige review! "The Paradigm Prestige series combines state-of-the-art design, ingenious engineering, and superb build quality with voicing that I found cinematically and musically unerring. Speakers that allow me one-setting enjoyment of action movies, with no dynamic range control intervention, are rare. Speakers that beat my reference system on orchestral material are rarer. But speakers that do both are practically unheard of. I learned a lot—and had a lot of fun—with the Prestige in my listening room. And living with the Seismic 110 sub continues to be a joy." Click here! to read the full review from Sound & Vision. Click here! for more info on Paradigm's Prestige Series. Click here! for more info on Paradigm's Seismic 110.